Critical Stakeholders of the South-South geopolitical zone held a crucial meeting on Friday, 30th November, 2018 at Uyo, Akwa Ibom state, under the auspices of the Pan Niger Delta Forum (PANDEF), to appraise the economic and sociopolitical State of the Zone, in view of recent developments in the nation’s polity. Delegates at the meeting, which was also attended by the host Governor, His Excellency, Udom Gabriel Emmanuel, Governor of Akwa Ibom State, included former governors, former national and state legislators, community leaders, Elders, Rights Activitists, Women and Youths leaders from the six South-South States of Rivers, Edo, Delta, Cross River, Bayelsa and the host, Akwa Ibom. The National Leader of PANDEF, Chief E. K. Clark sent his goodwill message to enrich deliberations at the Meeting. The former Governor of Anambra State and Vice Presidential Candidate of the People’s Democratic Party, His Excellency, Peter Obi, represented the Presidential Candidate of the PDP and former Vice President, His Excellency, Atiku Abubakar, at the Meeting to interact and share with the people their plans for the region and the Nation at large, if elected into power come 2019; and solicited the cooperation of the people of the South-South, in that regard..
i. The Meeting noted the worsening security situation in the country, the flagrant misuse of the nation’s Security Agencies by the federal government against governments and the people of the South-South States, and its implications for the forthcoming 2019 general elections. ii. Meeting observed with dismay the recent assault on democracy in Akwa Ibom State and by extension in Nigeria, by armed police at the Akwa Ibom State House of Assembly, whereby the police flagrantly and illegally used its powers to truncate the activities of the legislature, and constituting breach of peace in the State..
iii. Described as worrisome the arm-twisting of the Rivers State Government by the Nigerian Army by its invasion and disruption of the training session of the Neighborhood Watch trainees, an outfit legally established by the Rivers State House of Assembly, and well-intended to enhance security in the State. In spite of the fact that there are similar security outfits in other states such as Zamfara, Kano, Kogi, Osun, etc. that have not been harassed by any Federal Government Security Agency in any shape or form. iv. Observed with shock the action of the new Commissioner of Police in Bayelsa State by his withdrawal of the police attached to Operation Doo Akpo, a security operation for the coordination and maintenance of security in Bayelsa state, which comprises of the Nigerian Police, the Nigerian Army, Navy, Air Force, NSCDC and the Bayelsa Volunteers. The state government has used the operation to sustain peace and security in the State. v. Expressed worry over the increasing trend of desecrating our national institutions, particularly the Nigerian Army and the Nigerian Police Force, in using them for nefarious political ends by highly placed persons in Government. And decried the alarming and unnecessary turnover of Policer Commissioners in the region. For instance, Bayelsa State had 8 Commissioners of Police in a matter of 3 months. vi. Disturbed by the recent overrun of the military formation at Metele, Borno State by Boko haram insurgents and consequent massacre of Nigerian soldiers, the Meeting reiterated the call on President Muhammadu Buhari to urgently re-jig the nation’s military high command and security architecture of the country. 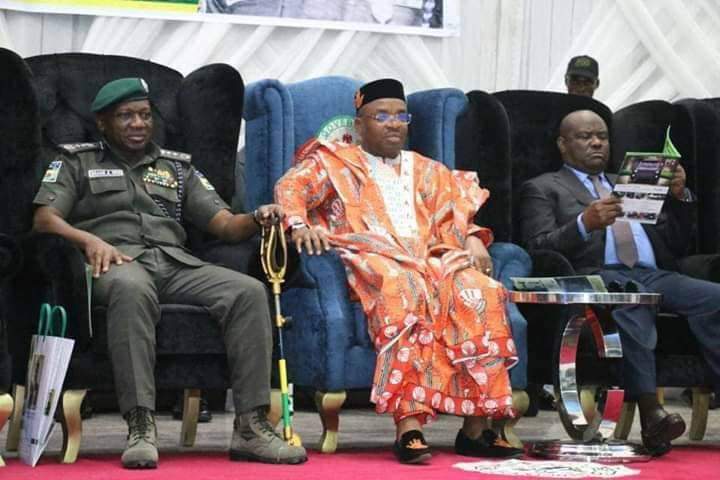 Called on the Public and the International Community to hold the Federal Government, the Inspector General of Police, Mr Ibrahim Idris and the Commissioner of Police, Akwa Ibom State, Mr. Musa Kimo responsible for any breach of peace in Akwa Ibom State, and other States in the South-South Zone. Admonished Security Agencies in the country to refrain from all partisan acts and focus on their primary roles of defending the territorial integrity of the country, and securing the lives and property of all Nigerians. Emphasised the firm resolve of the peoples of South South region to resist any act of intimidation and aggression against the governments and the people, or any attempt to make us slaves in a country that has been built with our resources and sweat. Urged the Governors of the South-South Zone not to be distracted by the antics of enemies of the Zone as the people are resolutely with them. Commended the Governors of the South-South States for their efforts at improving the lot of the people despite the harsh economic and political realities, and urged them not to relent. Restated the demand for the RESTRUCTURING of the country to promote true federalism, equity and justice, in the interest of the nation’s unity, peace and progress. Resolved to support only parties and candidates that align with the call for RESTRUCTURING of the country, and that such political parties and candidates must affirm to irrevocable agreement with the people of the Niger Delta before December 31, 2018. Warned that any attempt to use “federal might” to subvert the will of the Niger Delta people during the 2019 general elections will be vehemently resisted by the Niger Delta people. The Meeting, however, re-affirmed the commitment of the peoples of the South-South geopolitical zone to the unity, peace and progress of Nigeria, rested on the principles of Fairness, Equity and Justice. The Meeting observed a moment of silence in honour of the soldiers who were recently killed at the Metele Boko Haram attack and all other Nigerians who have lost their lives under similiar circumstances in recent times. And extended deepest condolences to the families of the fallen soldiers and the military high command for the regrettab le loss. projects and programmes, and described him as a high-performing Governor. The Meeting further commended the Governor of Akwa Ibom State for the warm hospitality extended to all the delegates who had come from the various States of the South-South Zone. Deji Adeyanju Granted Bail As Fani Kayode, Charly Boy Storm Abuja Court.